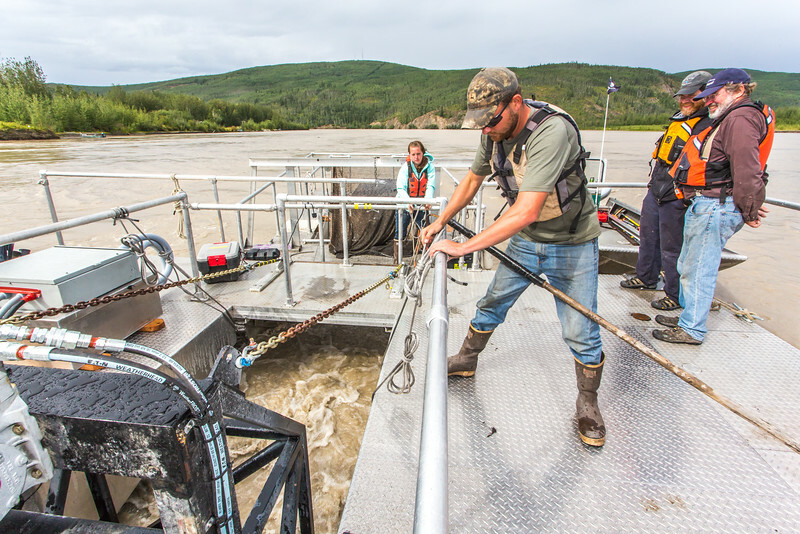 Parker Bradley, a biologist with the Alaska Department of Fish and Game, sets up a net housed under a turbine placed in the Tanana River near Nenana. The work is part of research being carried out by UAF's Alaska Center for Energy and Power (ACEP) to determine the feasibility of hyrokinetic generators being used to help offset the high cost of energy throughout rural Alaska. Behind Bradley is UAF fisheries undergraduate student Stephanie Jump who spent the summer of 2015 interning with Fish and Game on the project. At right are ACEP researchers Jeremy Kasper and Jack Schmid.